Sports Information Directors were making up all kinds of things in the 1980s. Nobody seemed to care when Bama’s dude did it. But Auburn caught hell. And that was kind of the point. 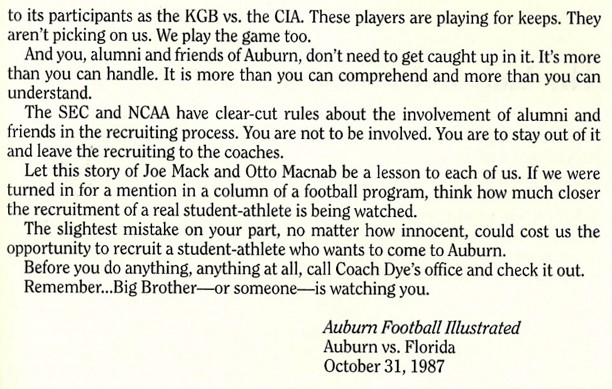 In 1987, Housel threw up some phantom bogies on the radars of rival SEC schools a la War Games’ W.O.P.R. (he actually did compare the whole thing to the Cold War—he has a knack for military analogies: Remember Dunkirk!) to make a point about the insanity of football recruiting. 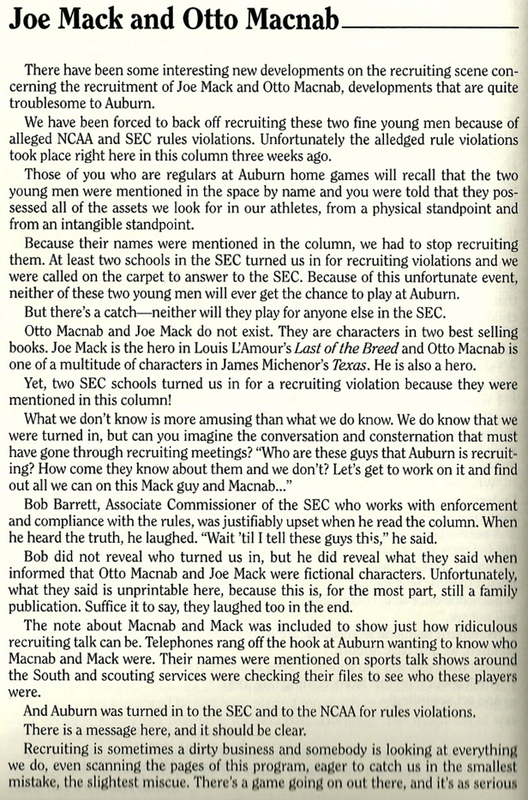 His column in the Auburn Football Illustrated for the Vandy game was a glowing profile on a couple of mysterious blue chippers other SEC schools had somehow never heard of but that Auburn was in the lead for, Joe Mack and Otto Mcnab. Which, yep, he mentioned by name. Which was a big NCAA no-no. Or it would have been had Joe Mack (“a great physical specimen”) and Otto Mcnab (“all the intangibles to make a great football player”) been real, and not characters in two books Housel read that summer. So which fictitious heroes was Housel scouting next? I wonder how long that final bit of advice is/was followed.